Three highly acclaimed directors of international repute joined together to direct three interwoven stories that take place during a journey from Central Europe to Rome. Tickets (2005) was intended from its inception to be made as a single feature film and not as three separate stories. It was the Iranian director Abbas Kiarostami who first suggested the idea and it was he who invited Italian director Ermanno Olmi and our very own Ken Loach to take part in this project. The three men had never met before but they were familiar with each others work. Total freedom was given to each director except for two rules: each of the sequences should be in some way connected and with the stories all taking place on a train. The first segment was by Olmi, the second by Kiarostami and the final by Loach in conjunction with writer Paul Laverty. The characters in the stories connect through casual encounters and set forth a story of love, chance and sacrifice. An older businessman finds solace and a new insight into life when he is forced to wait at the train station due to bad weather. A young man is reminded of life's obligations and is introduced to love. 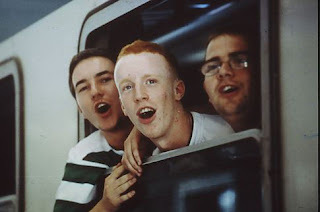 Three Scottish lads on their way to the football match of their dreams are forced to open their eyes and see the bigger picture. This single train journey sparks changes for many people. This is a film about privilege and exclusion, and the reality of the value of just one ‘Ticket’. Sit back and enjoy the work of three directors who obviously have a lot of mutual respect for each other.